Hi everyone! I hope my US friends enjoyed a long Memorial Day weekend. I was at my cabin and spent the weekend with some great friends and family! The card I'm sharing today I colored on Saturday before I left, but didn't have time to finish it. I wanted to enter the Papertrey Ink blog hop, but didn't get it done in time. But I could still enter it in the Fusion Card Challenge! I loved the photo this week. It gave me a chance to use a couple of PTI stamp sets I have never used. I just love these tulips! I colored them with various RV, YR, BG, and YG copics. This is a very large stamp and I hade to make the card 4.25 x 6. It didn't leave much room for embellishments. As it is, I used Sweet Threads dp from Basic Grey which is hard to see. I managed to add a bow and some pearls in the corner. I also added some sparkle with a sakura glitter pen. Hard to see in the picture. That's it for me! Thanks for stopping by and see you soon! Lisa...absolutely stunning! I have been wanting a jar stamp...now it's a must! Gorgeous, gorgeous vase of flowers Lisa! This did turn out really well, Lisa!! 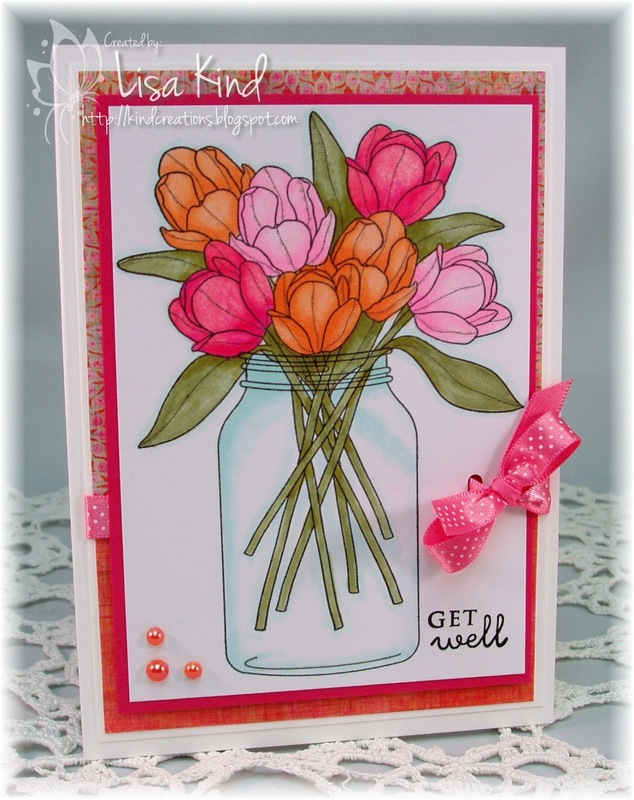 I love the pinks and oranges and the way you fastened the bow on the card! LOVE your coloring! Thanks so much for joining us at Fusion! Beautiful flowers. So glad you joined us this week at Fusion. Gorgeous flower bouquet and fabulously coloured. Absolutely ADORE the ribbon treatment. Congrats on being an honorable mention!! 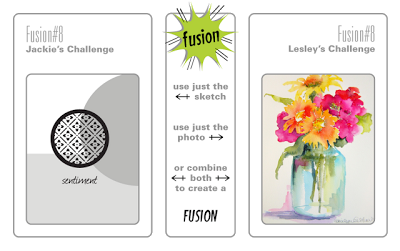 Your card was a real standout in the thumbnails at Fusion, Lisa! Congratulations on the well-deserved HM honor from your peers! !